My grandmother, Margaret Cruden and her brother Stewart. Circa 1915. Bairns in kilts. Missing Scotland today. 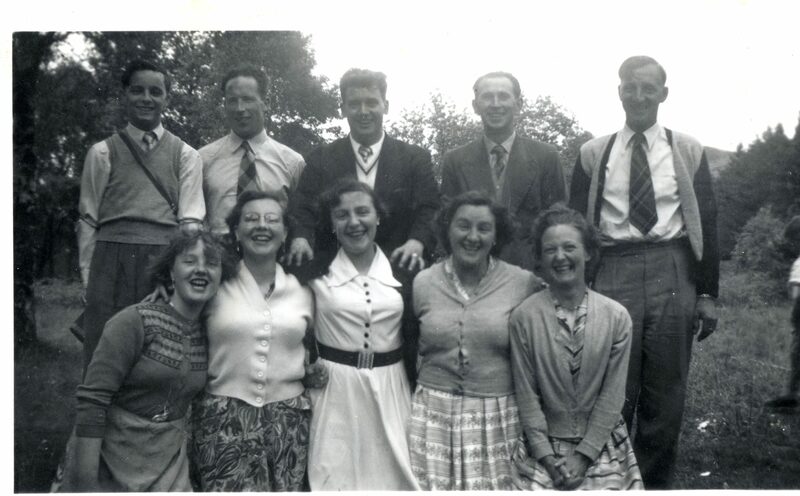 The Ramsay sisters – and brother – with their partners. My mother is one of six children; five daughters and a son. As in most families, relationships between the siblings are complex, so I love the way this photo captures five young couples starting out life together bound by ties of love and kin. My parents are in the middle. Not exactly wordless, but brief. 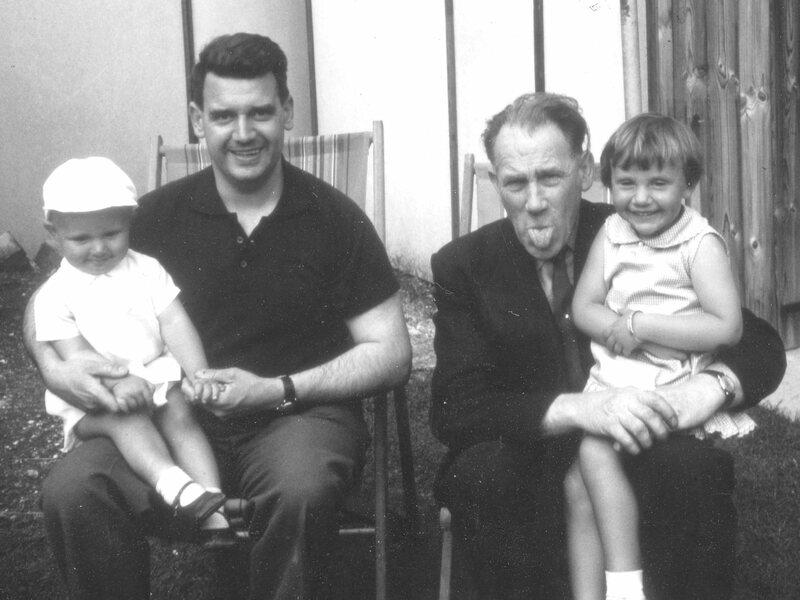 With my favourite uncle; my grandad’s brother Tom Leslie. With us is my dad and baby brother. 2.Susan Forbes, my great great grandmother. I’m named after my grandmother Susan Forbes Nicholson Elder, who was in turn named after her grandmother, Susan Forbes. I’ve managed to learn quite a lot about my 2x great grandmother, and she seems like a strong, hard-working entrepreneurial woman. She bore at least eight children – three of whom died in the first weeks of their lives – and raised her daughter Anne’s illegitimate son. She died in 1912, aged 72, leaving a comprehensive and slightly mysterious Will. I’d love to meet her and find out who the men she named as Trustees of her Will were, and why she appointed them. I’ve long suspected that one of them was the father of her daughter’s child. 3. My great grandmother Catherine Black. 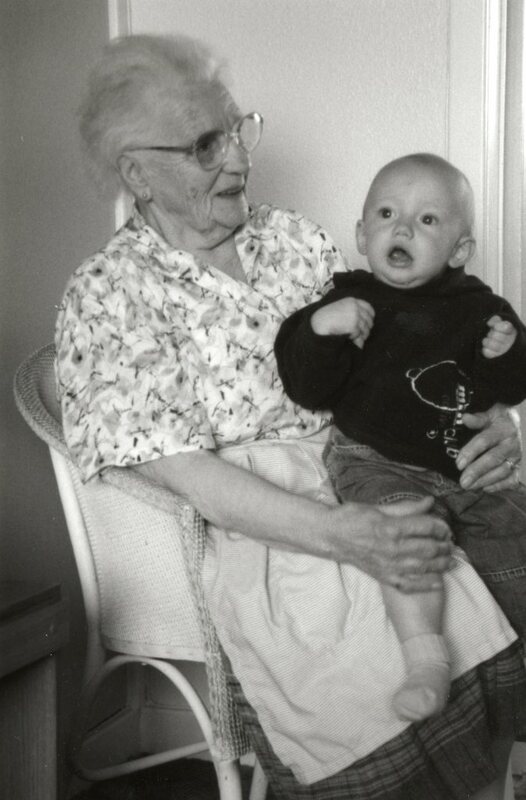 I’ve written quite a lot about my formidable great gran and although I have strong memories of her, I would love to have her to dinner and be able to ask her all the questions I have now that I would never have thought of, or been able to ask when I was a child. She was a very resourceful woman, with an incredible sweet tooth so I’d ask her to bring dessert. 4. My great, great grandmother Isabella Simpson Wallace. Born in rural Perthshire in 1866, her father died when she was only six, and she had to move to Dundee with her mother and siblings. Her mother remarried and bore several more children. I don’t know if Isabella had a good relationship with her step-father, but several of her children bear his surname as a middle name, so I like to think so. She married my great, great grandfather Stewart Camerson Cruden in 1886 and seemed to spend the rest of her life on the move. The family had multiple addresses in Fife, and at one stage emigrated to the United States where they lived in New Jersey for about 10 years. Isabella experienced several tragedies, in addition to the death of her father. She seems to have suffered several stillbirths; her youngest daughter died, aged 20, of eclampsia and her younger son, Stewart drowned in the Barents Sea while serving on the Arctic Convoys. From the photos I’ve seen of her, she seems like quite a dour woman (maybe not surprising), but I’d love to meet her. I think as well as being interesting in herself, she could also have answers to lots of questions about that branch of my family. 5. Elizabeth Robertson, a 3x great grandmother. Elizabeth was born in 1798 in Dallas, Morayshire. At the age of 24 she bore a son, out of wedlock to John Leslie. That son, George Leslie, was my 2x great grandfather. I know quite a lot about George’s marriage and later life, but his early life is a mystery. I’ve also been spectacularly unsuccessful at finding John Leslie, and thereby tracing my surname back beyond the early 19th century. But apart from wanting to know about Elizabeth’s relationship with her son and his father, I would also like me meet her. It appears that she never married, lived most of her life in Elgin, and died aged 83 in the Poorhouse. 6. Thomas Boswell Bisset – 3 x great grandfather and man of mystery. Thomas Bisset seems to have been born Thomas Gordon, in Wemyss, Fife in 1831. He was the illegitimate son of Elizabeth Grieve and John Gordon. Like George Leslie, Thomas’s early life is a complete mystery to me. From his marriage to Helen Simpson in 1851, he becomes a little more visible and towards the end of his life the recorded evidence of his existence mounts up. But it is confusing; not least because his birth, marriage and death records all contain different names for his father. And where does Boswell come from? My family seems to have adhered quite strictly to the Scottish naming pattern, and I can’t find a Boswell connection anywhere. Apart from all that, Thomas fathered at least 13 children, and I can’t help thinking of him as a bit of an old goat with a twinkle in his eye – and hopefully a few good stories to tell. 7. Alexander Gerrard; a 4x great grandfather about whom I know little except that he was a handloom weaver from Abbotshall, Fife. I suspect that I may not ever get to know much about this man from official records. Like many of my working class ancestors, he has left little trace in the archival record. It would be fascinating to meet a man who lived his entire life in a small area of Scotland that I know well, though I doubt we’d recognise much of what the other was talking about. 8. Susanna Fowls is a 4x great grandmother, and the first Susanna I’ve found from whom the rest of us are descended. She was born in 1786 in Portmoak, Kinross and in 1806 married John Forbes in Abbotshall. I like the idea of having the Susan’s well-represented at the dinner table, and hopefully she can tell me who she was named after – allowing me to delve further into the eighteenth century. 9. David Skinner Ramsay, a 3x great grandfather who seems to have been one of few ancestors who could be described as having been affluent. He’s described in the 1851 census as a Master Miller. Although he’d been born in Dysart, Fife, the family seemed to live in Abernethy, Perthshire for many years, where the household included a couple of servants. He died in his 50s, in what looks like reduced circumstances. His sons seem to have become coal miners, so I’d like to be able to ask him about the turns his life took. 10. Jane Morrison Cruden. 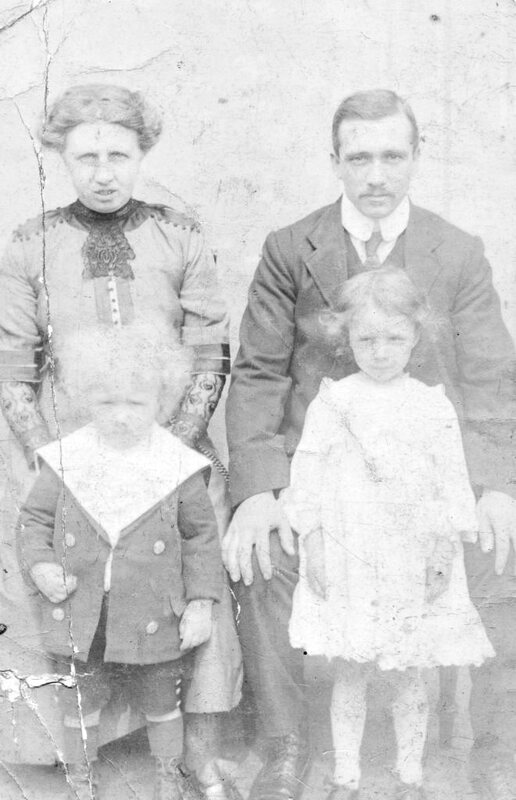 My great grandfather Alexander Cruden had an older sister called Jane (or Jean). She was born in 1887 in Dundee and appears in the 1891 and 1901 census records alongside her parents and siblings. After that she disappears from the Scottish census records. My mum, who was very close to her grandad and his family, had never heard of an older sister. She could tell me a great deal about great grandad’s other siblings, but Jean was a mystery. 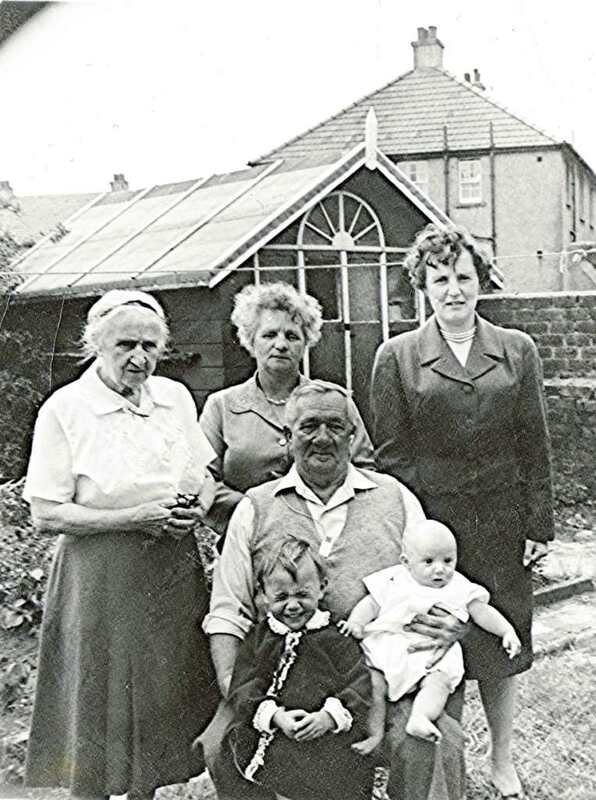 The only traces I’ve found of Jean Cruden are a record of a marriage to Cecil Leach, in Middlesborough in 1924, and the birth of a daughter – Jean Morrison Leach in Middlesborough in 1926. I’d like to invite Jean to dinner, partly to find out why she left home and apparently didn’t return, and partly because I’m also inviting her sister-in-law and grandmother, and it might be nice to have a family reunion within a family reunion. Or not! Aubigny Communal Cemetery Extension, Pas de Calais, France. Final resting place of Thomas Boswell Bisset (9 November 1890- 2 April 1917). Photo credit: Commonwealth War Graves Commission. 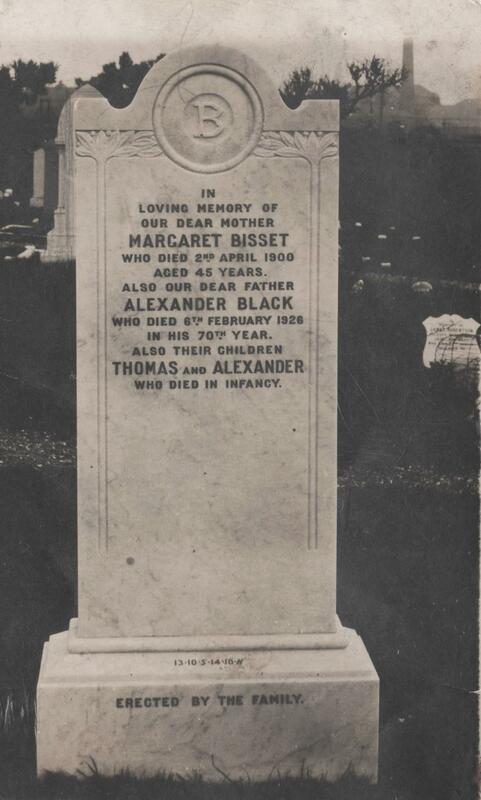 For last week’s Tombstone Tuesday I posted a photo of great great grandmother, Margaret Bisset‘s, headstone. The photo piqued my interest, and in trying to find out more about this branch of the family, I stumbled upon a reference to Lance Corporal Thomas Boswell Bisset. Thomas was Margaret’s nephew; the eldest son of her brother William Reekie Bisset and his wife Susan Miller Thomson. This makes him my first cousin, three times removed. From the Commonwealth War Graves Commission website, I discovered that Thomas served with the Black Watch, and died on 2 April 1917. He is buried in Aubigny, Pas de Calais, France. Assuming that Thomas was buried in Aubigny because he was killed nearby, I Googled the date and location to see what military action was taking place at the time of his death. What I found was the Battle of Arras; a major offensive involving British, Canadian and ANZAC troops which took place between 9 April and 17 May. Thomas’s death is recorded as occurring a week before the battle began, but it seems that prior to the offensive itself there were significant casualties on both sides as each army prepared for the battle both knew was coming. It is estimated that the six week offensive cost 160,000 allied troops their lives – as well as those of a similar number of German soldiers. Thomas Bisset is the second member of the family we’ve found who is buried in a War Cemetery in the Pas de Calais region. The Big T has a great uncle who was killed in March 1918 at the 3rd Battle of the Somme. Private Eric Andrew Gray was a member of the New Zealand Expeditionary Force, and served in the Canterbury Regiment. From Archives New Zealand, we were able to get a copy of his war record which told us a little about a man the Big T had grown up hearing about. The records didn’t tell us anything about Eric’s death – except the date – but we did manage to piece together some understanding of his final days from the Regimental War Dairy which is available online through the New Zealand Electronic Text Collection – an initiative of Victoria University of Wellington Library. 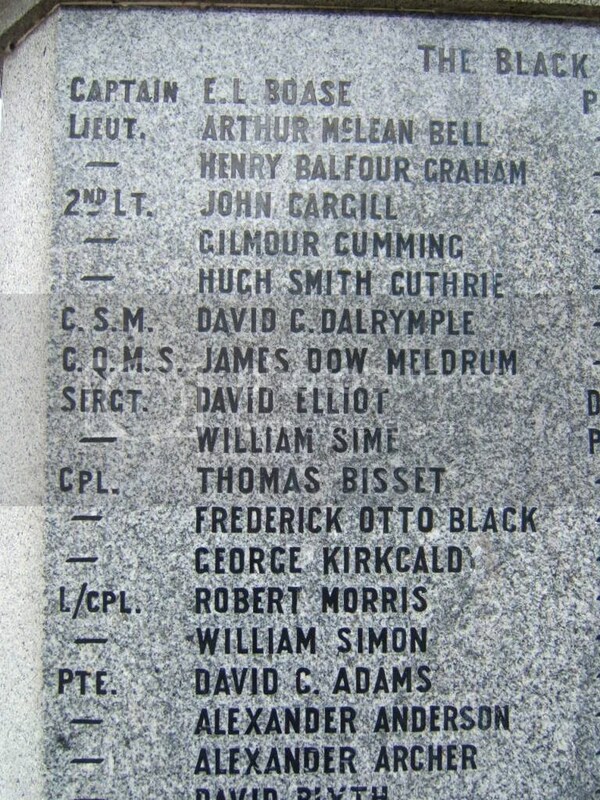 I have been to the Black Watch Museum website to see if they hold something similar, but no joy, so I will have to try and piece together the movements of Thomas Bisset’s Battalion through other sources, and with luck I will be able to find his war record on Ancestry. A week ago, I knew nothing of the Bisset family. But by becoming interested in a picture of a headstone, I have climbed a branch of my family tree that has so far produced a war casualty, a man with at least two surnames (and three different “fathers”) and a connection to a 1920s tourist attraction. Watch this space! A post-script: do all babies look the same, or is there a strong family resemblance between my brother and son? 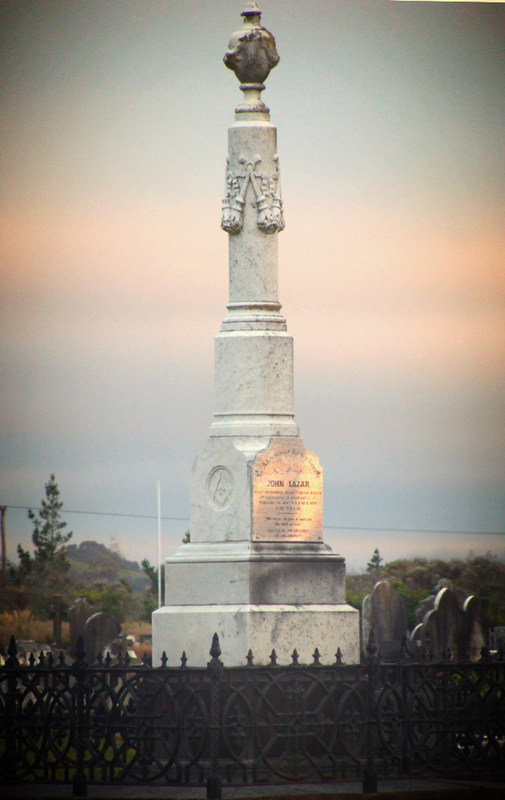 Monument to John Lazar, Hokitika Cemetery, Westland, NZ. Photo: Su Leslie 2008. I took this photo five years ago in the cemetery in Hokitika, on New Zealand’s West Coast. One of the Big T’s aunts had once lived in the town, and we’d gone for a little tiki tour to see if he could find her house. Hokitika isn’t a big place, so it wasn’t long before we found ourselves on the edge of town; on a hilltop at the cemetery gates. I love cemeteries; T hates them. So it probably tells you all you need to know about my partner that he was willing to spend the twilight of a summer’s evening in a graveyard. I didn’t know who John Lazar was. I took the photo merely because – as we were walking back to the car – a last finger of sunlight rested briefly on his monument and it made for a nice shot. It has taken me five years to wonder “who was John Lazar”? The answer made me smile and think about the nature of co-incidence. John Lazar was born in Edinburgh in 1803; 158 years before I was born there. He emigrated to New Zealand in the late 1860s; my family did the same in the late 1960s. And John Lazar was a life-long Freemason – like my father. He also sounds like an interesting character. I found this wonderful photo of John Lazar at Early New Zealand Photographers. The photo itself is in the Alexander Turnbull Library in Wellington. If there is a point to this story – other than to celebrate a New Zealand pioneer (and that is a worthy point), it is to say thank you to the institutions and people who work tirelessly to make historical information available online; so that everyone from dedicated family historians (of which group I consider myself to belong) to the mildly curious (which is all I really was in this case) can know more about the characters who populated our past, and the events that shaped them. Papers Past; a wonderful initiative of the National Library Te Puna Matauranga o Aotearoa which is working in conjunction with libraries, historical societies and others to digitise New Zealand’s newspaper archives. New Zealand Electronic Text Collection – Te Pūhikotuhi o Aotearoa, part of Victoria University of Wellington Library. This wonderful initiative contains both digitised historical texts and born-digital materials relating to New Zealand and the Pacific Islands.